"Here's a little twist to a great chocolate dessert fondue using one of South Africa's most exotic liqueurs. I found out about this wonderful liqueur on a trip to Cape Town and knew it would be a great ingredient in many recipes. 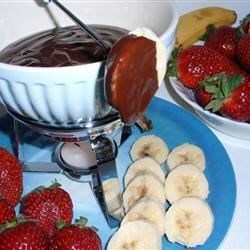 This dessert fondue is terrific with cookies, strawberries, orange slices, melons, marshmallows, etc. It is extremely easy to make, but your guests will think it you slaved over it." Do you have to add the liquor cause it sounds so good i want to give it to my kids! Really good. You could play with other liqueurs such as kahlua, gran marnier, cassis, Irish cream, etc. You may have to lessen the volume though. I made this for boyfriend, he loved it! You can get this special liquor at beverages and more, or cost plus. It really gives it a amaretto/bailey's taste. DELICIOUS! Delicious! The liquor made this orginal and tasty. I served this with orange pound cake, marshmallows, strawberries and bananas. Easy and quick to make with great results. We used Kahlua instead of the other liquor, it worked fine. I used Contrieu instead, and it still turned out great!